Aphids are small, soft-bodied insects 2-4mm long. They often cluster on fresh young shoots and flower buds or even underneath older leaves. Aphids come in a range of colours - from light olive green and pinkish to dark green and black. In more temperate climates and especially in protected environments and suitable hosts are available, continuous reproduction by females alone is possible. Females give birth to live female young at the rate of 4-6 per day! A female will give birth to more than 100 live young over her lifetime of one to four weeks. These young can mature into adults in 4-7 days in summer and immediately begin producing live offspring. 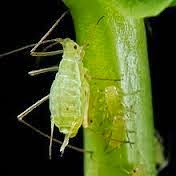 The ideal temperature for aphids is about 22 degrees C - no development generally occurs below 5 degrees of above 33 degrees C. Their colonies multiply rapidly and large infestations can develop in a matter of days. The aphid can also transmit virus diseases which can often have more impact on the crop than the actual feeding itself. The sticky honeydew excreted onto the plant by aphids provides an excellent environment for sooty mould and viruses like broad bean wilt. There are natural predators such as ladybird beetles, parasitic wasps, hoverfly larvae and lacewings. The wasp lays eggs inside the aphid giving it a hard light brown shell-like appearance. The ladybird larvae which looks like tiny bird droppings are actually voracious eaters of aphids. Both of these natural predators will dramatically reduce Aphid numbers quickly however they usually lag behind the build up of aphids and some damage can occur before effective control is achieved. Control: A natural way is to try spraying cold water on the leaves, sometimes all aphids need is a cool blast to dislodge. The use of commercially available biological controls or by spraying with insecticidal soap or horticultural oil may be the way for you. For the totally 'green' solution you can purchase beneficial insects, such as lady beetles and parasitic wasps which will feed on the aphids.